First off, the “jaws” of honeybees are really called mandibles. “Mandibles” is a lot to get in a header, and they do act as jaws. The mandibles open side to side rather than up and down like our jaws. The queen’s mandibles and the drones’ mandibles are pretty similar, to each other and other arthropods (a phylum that includes insects, spiders, crustaceans). However the mandibles of worker honeybees are a little bit different. Queens and drones have pointed mandibles that have notches at the end. Worker bees have smooth spoon-shaped mandibles. Honeybees are in the order of Hymenoptera (which is under the arthropod phylum), which includes bees, wasps, ants, sawflies and more. For the majority of these insects, mandibles are for cutting and biting. Honeybee queens and drones follow this traditional pattern. Worker bees don’t need to cut and bite as much as they need to mold wax. So they evolved a different set of mandibles. They still open from side to side, but their smooth spoon-tipped mandibles are perfect for molding wax into shape. Amazingly (to me) these smooth jaws can still cut away wood, uncap worker and drone cells, and give a pretty good bite. Interestingly I searched all over the web and in books for this information. Current sources kept saying queens and workers have different mandibles. It was only when I came across “The Anatomy of the Honey Bee”, written in 1910 (! ), by Robert E. Snodgrass , that I found why queens and workers have different mandibles.. Sometimes you just can’t beat those older sources. Queens have bigger mandibles than drones, who have the smallest mandibles in the hive. Both queens and drones have a notch just below the tip of the mandible just like most bees, ants, wasps, and other insects of the hymenoptera order. It seems that queens use these notches for cutting their way out of their very dense queen cells. I figure (this is a guess) that they come in pretty handy in a queen versus queen fight as well. Plus the queens and drones have no need to push and mold wax, so no need for spoon-shaped mandibles. Drones probably have notches because most insects in their order have notched mandibles…no evolutionary need to change. The queen has these, workers do not. These glands produce the pheromone that tells the hive : we’ve got a good (or failing) queen. The same pheromone attracts drones for mating. Once mated, queen steps up production of this pheromone, which takes us back to “we have a good queen here”. All that and so much more, which is for another blog post. For this post, I was simply fixated on the question of “why are a queen’s mandibles notched, and a workers are not”. This blog topic was inspired by a really wonderful presentation by beekeeper Pat Ray at the Skagit Valley Beekeeper’s meeting last week. Pat’s presentation covered both the biology of the honeybee and “a year in the bee yard”. Brilliant, talented beekeeper Jody Gerts (scroll down to find her), gave Pat a number of PowerPoint images to use. When he got to the one about how queens differ from workers, there was this line about queen mandibles being notched while workers are smooth. Pat admitted he didn’t know what that was about. It doesn’t affect beekeeping, but it got us wondering. 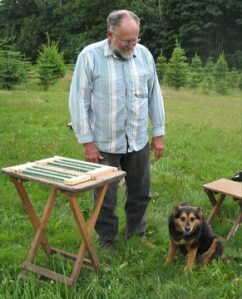 Pat’s a 4th generation beekeeper (that’s his “pup” who is a constant companion in the beeyards) with whom I had the great pleasure to work with on and off for two years. He knowledge about beekeeping is amazing, and, better yet, he’s very willing to share that knowledge with beekeepers new to the world of bees or folks who have years of experience under their bee suits. I could go on about all I learned from him, but I think the most telling moment was when I turned up to help him and Bruce Bowen make splits. Bruce had a partial suit on. Pat was standing there in shirtsleeves, no veil. Me? I was in a full bee suit. “You’re going to laugh,” I said a bit self-consciously as I put on my suit. “No,” Pat said. “When working bees you’ve got to wear whatever makes you comfortable. If you’re comfortable, the bees are comfortable.” Care for others and for the bees – that says a lot about Pat Ray. They are in cluster. Periodically a few stick their heads out and say “geeze it’s cold out there” and go back in). Which means I get to spend hours at the library (the only WiFi location in this area) trying to sort out a mess, which occurred when I began to switch from one web host to another. The PacificNorthwestHoney.com website went down. And I don’t really talk webtech. So you can see why I’d far rather talk about the interesting evolutionary adaptation of worker bees’ mandibles. 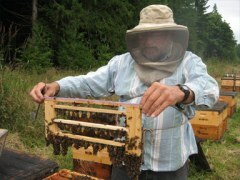 That’s the news from Brookfield Farm Bees And Honey, in Maple Falls Washington what’s happening in your area bee-wise? This entry was posted in Honeybees -interesting stuff and tagged Brookfield Farm, honeybee, jaw, mandible, Maple Falls, queens, Washington, worker. Bookmark the permalink. As soon as it is born, the first queen bee has the mission of eliminating all the larvas in the other royal cells because she has to rule without dividing the colony. If a second queen bee is born at the same moment, the two queens fight pitilessly and the victor takes control of the hive. From 3 to 6 days after its birth, the young queen flies away for a unique nuptial flight where she mates five or six times with a dozen drones. The flight is repeated until the queen’s spermatheca (a kind of sperm reservoir) is full. Once fertilized, the queen returns to the hive and starts her life as a layer . During her four or five years’ existence, she will stay in the hive and her mission in life will be to lay up to 2000 eggs a day non-stop – about an egg a minute!. Continuously surrounded, protected and fed by worker bees, she is the object of all their attentions. I agree – I think the queen’s mandibles help her emerge from her cell (thicker than the workers), and fight other queens. I’ve always understood that the first queen to emerge stings the other, non-emerged queens – so don’t know if the mandibles would help there. Only place I would disagree is is “she mates five or six times with a dozen drones.” She usually mates ten or more times with that many drones — the drones die after one mating. I see you are as fascinated by these animals as I am.